Ok it seems like ages since I’ve posted about food 😀 Love it or hate it, here it is, the next instalment of Scrumptious Saturday. 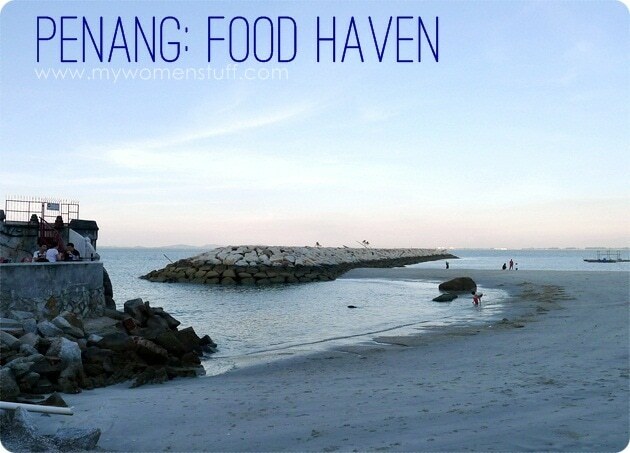 This time, its a selection of food photos I took on a short overnighter up north for work to the lovely Pearl of the Orient – Penang, popularly known as a street food haven. So since its a street food haven, I had to stuff myself silly didn’t I? Make the most of my rare trips up North 😉 The picture above is of the seaside at Tanjung Tokong. There is a little seafood place there I sometimes go to, overlooking the beach and when the weather is good, you get vistas like this. Beautiful! When your food is served, you get vistas like this! 😀 Not street food but this isn’t a swanky restaurant either. Chairs and tables are rickety and the food is best enjoyed in the open air. The crabs are fresh, albeit small and are simply dry baked so the natural sweetness is retained. 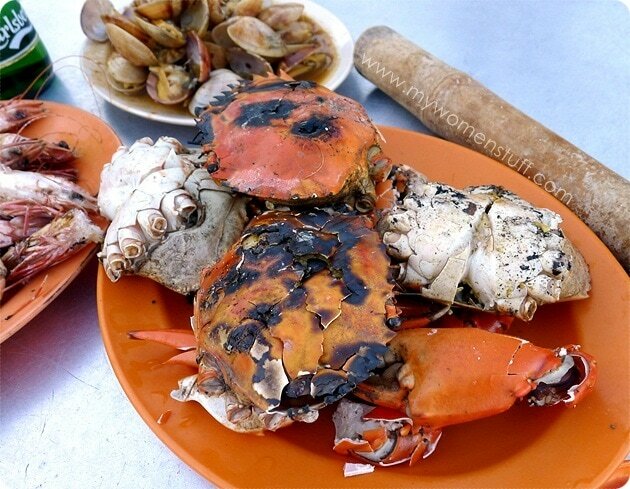 I love crabs done this way because there is a lovely smokey flavour that tempers the sweet flesh. Its a messy business eating crabs so be prepared to get down and dirty for a good meal! Oh and see that piece of bamboo? Its for you to crack the hard crab shell LOL Way more effective than a nutcracker that you usually get with having crabs, I can assure you! 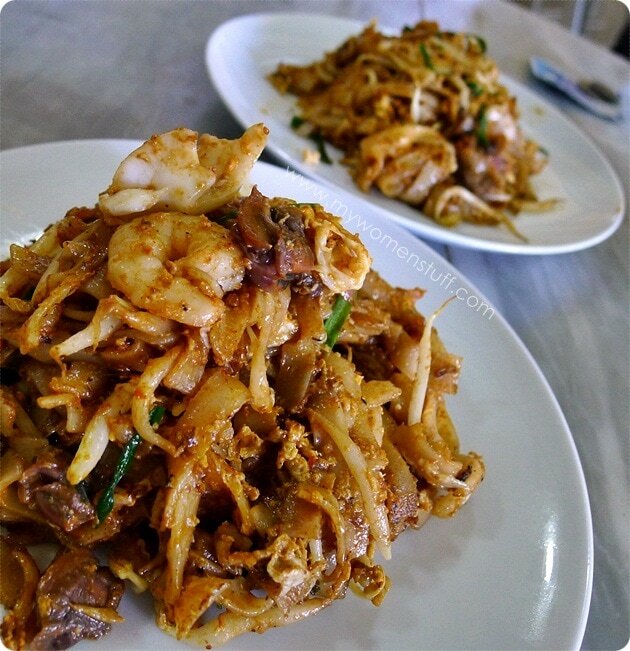 What is a trip to Penang without partaking in Char Kuay Teow (fried rice noodles)? Tastes differ greatly from stall to stall but I like this one from the stall at Sin Hwa coffeeshop opposite the Pulau Tikus police station. The noodles are relatively well fried with enough “burnt” flavour, and is dry, the way I like it. A bit of trivia: This stall has been here for 3 generations! I believe its the grandson now carrying on the business. 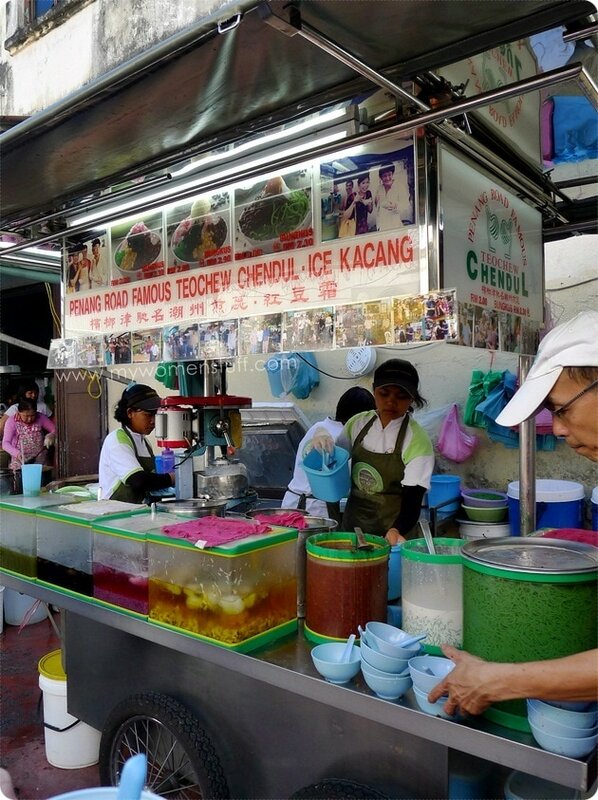 On the way out, we stopped to cool down with the famous Penang Road Teochew Chendol. Chendol is the green rice flour strips that you see, which is served with shaved ice drenched with palm sugar (gula melaka), coconut milk and red beans. A refreshing treat on a hot hot day. Its very interesting to note that on Penang Road are 2 stalls opposite each other selling pretty much the same thing. Yet, one stall serves up a much nicer treat as compared to the other and is markedly more busy. This is the stall you want to visit. Finally, a fried snack to accompany us on the 4 hour journey back to KL – Penang Lobak (pork rolls) and prawn fritters. 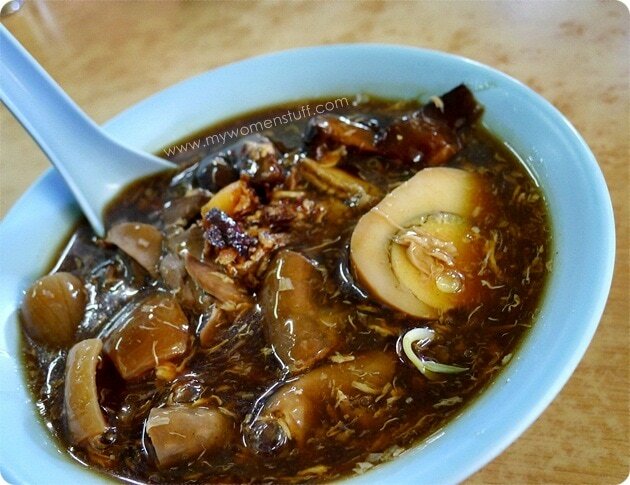 Ever since we discovered this stall at Tan Jetty, Weld Quay I try not to miss this. The pork rolls (lobak is sometimes made with Chicken too but not at this stall) are delicious because they are made from strips of meat, not minced. 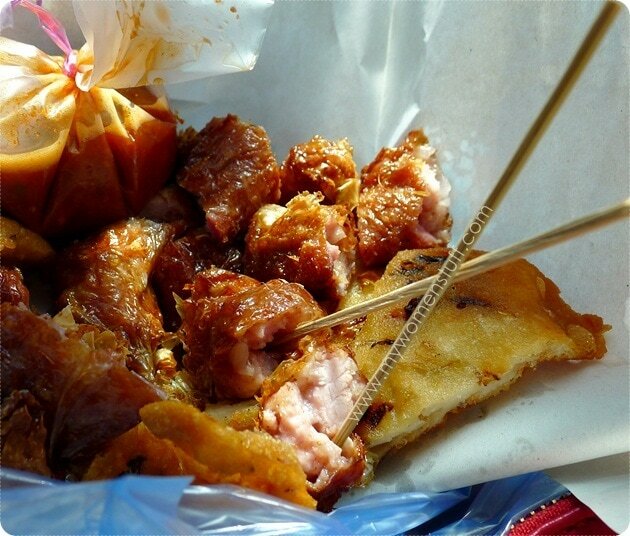 The meat is flavoured, then wrapped in beancurd skin and deepfried to a crispy golden brown. It is juicy and flavoursome and absolutely scrumptious! The prawn fritters have shrimps mixed with batter and deep fried to a crispy snack. So. Good! Scrumptious Saturday: One day of the week where I indulge in my other love – Food! It will feature my cooking experiments or eating and travel adventures. 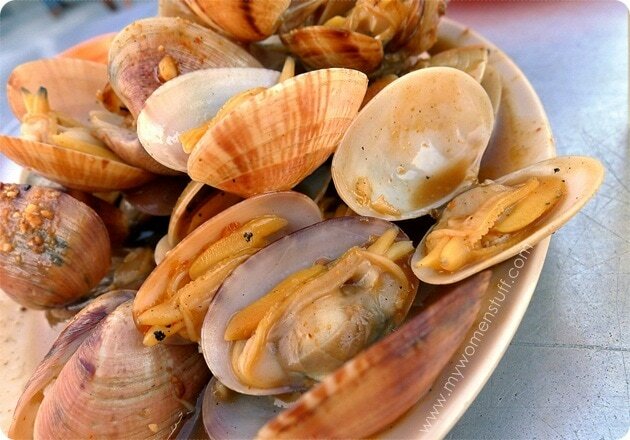 Yes, I will travel for good food. PREVIOUS POST: Not quite New : REN Skincare is back and they brought us new stuff! 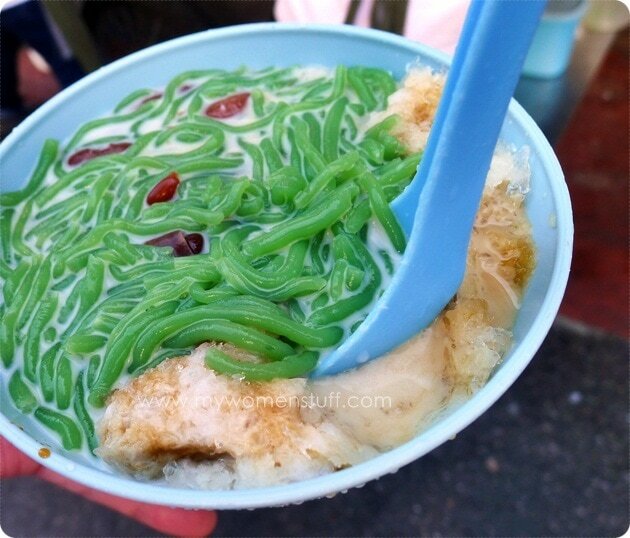 Oh that Chendol looks super good like the olden days’ style when my aunty used to make it. Don’t think anyone make that green jelly here in singapore anymore. Mostly i suspect are factory made and rather tasteless. Ahhh…i’m getting all nostalgia just by this pic alone. Haha. Malacca’s cendol is definitely wayyyy better than the Penang one 🙂 try the one at Melaka Jonker 88 Durian Cendol & Ice Kacang.